We ripped into #7 and fully remodeled her ... you'll love it! She was nicknamed the "Tiny Little Cabin" by a grandchild so we call her TLC - and it is cute! 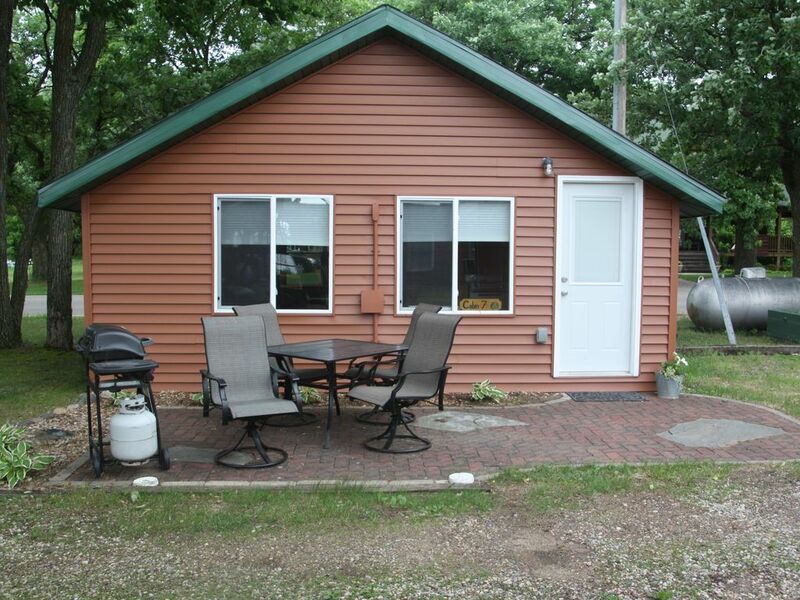 This is a great little cabin to be on one of Minnesota's best lakes, Otter Tail, but at a fraction of the price others are paying. Enjoy a classic Minnesota family vacation on Otter Tail Lake, where great walleye fishing and unbeatable water recreation give you the best of both worlds. The Lake is abundant with Jumbo Perch, Crappies, and large Northern Pike. Prime fishing is early and late in the season, which is nice since rates are reduced during this time. 14’ & 16’ fishing boats, 17.5' ultimate Fish & Ski Boat, a 24’ pontoon or lifts for your boat are available for rent. Fishing Guide Service is also available. Water recreation begins with our natural sand beach, ideal for small children. Our beach is great for building sandcastles or playing water volleyball. Otter Tail Lake is also great for boating, water-skiing and many other water sports. Enjoy our canoe, paddleboats and playaks. Windy days find bright colored sailboats adding to the lakescape. This cabin features a full kitchen including microwave. It is fully furnished including bedding, but please bring your own towels. The cabin has a barbecue grill, picnic table and a color cable TV. A nearby recreation room, which provides entertainment and relaxation for the entire family. The lodge has a pool table, pinball machines, video games, books, board games and more. On cool days, stay cozy in front of the large stone fireplace. For your convenience, the snack bar serves ice cream, pop, pizza and candy. The area is great for vacationing. Enjoy visiting the shops in Battle Lake, Perham, Fergus Falls and many country boutiques. Take the family on a relaxing tube ride down the Otter Tail River. Golfers choose from the many area championship golf courses including Thumper Pond and Balmoral. The cabin is located between two great Minnesota State parks, Glendalough and Maplewood. All non motorized water toys are free for guests to use including paddle boards, paddle boats, canoe, kayaks and swim rafts. We rent fishing boats, fish/ski boats, pontoons and jet-skis by the hour, day or cheaper for multiple days. The Lodge on Otter Tail Lake is what a week up north is supposed to be. Quiet atmosphere, friendly people with lots to do. Even on a cloudy and dreary day there is something in the area to do. Or just hang in the cabin. (family time). The cabin we were in was remodeled over the winter and looks awesome. All pots, pans, plates and utensils are provided for you. I would fully recommend this or any of the cabins available at the resort as they are all in a great location. Looking forward to upcoming year to do it all again. Thanks for your kind words. We are blessed to be in an area with so much to offer. It does amaze us that it remains as quiet around here as it does, but we don't complain about that. Enjoy your year. Hope to see you again soon. For the most part I felt our time at Otter tail was fabulous. The Ness family was super nice as well as more than accommodating. We had an overall quiet and relaxing stay. The only cons I would say would be the condition of the cabin. Though it was partially updated, we found that there were a few more projects that should be considered, which would improve the overall rating of our stay. These improvements of the cabin could make a huge impact for future bookings. We are glad you enjoyed your time on Otter Tail Lake. It was fairly quiet in the area, which makes a nice get-a-way in September. Thanks for your honesty on the cabin. We have had those projects in the works for a while. Actually this cabin was recently sold. The new owner plans to do some major remodeling this winter and will continue to rent this cabin out after it is completed. We will post new pictures when it is completed. I really love this place. We were here last year also and it was like we never left. All the toys you would need for water fun (young and old). Cabin was clean, cozy and roomy. The whole lodge is like one big family. Plan to be there again next year. Stayed at this cabin in July 2017. It looks cute from the outside. The cuteness/quaintness stops at the door. A wall A/C unit that could not cool until the sun went down, a floor that was uneven, evidenced by a patch attempt that started at the door and carried through to mid cabin. Couch was beyond worn out, the same for the 2 double beds. The electric stove had all elements, but none of them were flat, so all cooking if used was on an angle, and all were angled differently. Outdoor grill looked poor, unclean and unkept, opening it proved the same, it functioned. We ran out of propane on day 2. Spoke to one of the owners about the problem, "no worry we will take care of it". Day 3, 8 pm, no propane, attendant had no clue where to get another bottle. 15 minutes later, the attendant shows me, where I can get the bottle and replace myself! Owner, knew very little about fishery aspect of lake. Dock space was excellent. Parking was very limited. Fishing was fair to excellent, that was the only saving grace, for the totally overpriced, minimal amenities, "A "frame. If you are vacationing and looking for just above the minimum at an overboard rate, this the spot! Will not recommend or return. Too many newer looking, maintained facilities around the lake. We are sorry you did not find this cabin to meet your vacation expectations. We are continuously improving our cabins and will be putting a new floor in the living space this fall. We are glad you liked the new siding, windows and roof that have been installed within the past few years. I know you spent quite a bit of time on the newer paver patio outside the cabin, hopefully you enjoyed that. We are glad fishing was good for you. Otter Tail Lake is a great walleye fishing lake. We know you were disappointed when we called you while out on your boat because you thought you had another night to stay and enjoy the great fishing. Please check your reservation dates and check-out times to avoid this frustration in the future. We do disagree that this cabin was "totally overpriced" as you mention. You were offered a rare partial week reservation for a 2-bedroom cabin on Otter Tail Lake in July. You paid only $150 per night for 4 nights on a last minute deal. We wish you well in your future travels.